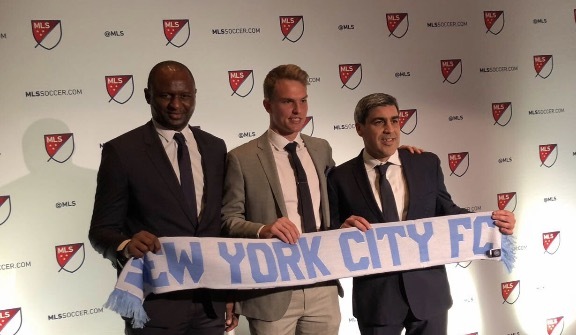 NYCFC's top pick Jeff Caldwell with Head Coach Patrick Vieira (left) and Sporting Director Claudio Reyna (right.) Photo courtesy NYCFC. New York City Football Club selected goalkeeper Jeff Caldwell from the University of Virginia with their 19th pick in the First Round of the MLS SuperDraft 2018 on Friday afternoon in Philadelphia. In the Second Round, NYCFC acquired defender AJ Paterson from Wright State University as the 42nd pick overall. At the SuperDraft, Caldwell said, "Hearing your name finally get called is an indescribable experience. And for it to be at such a massive club and with such storied guys around it, with Patrick Vieira, David Villa, and one of my personal heroes from the University of Virginia, Claudio Reyna, I can’t contain my excitement. "There can’t be a better opportunity anywhere in the league. I don't think there are many places in the world where you can get a better environment than that. "I think I'm a quicker guy, I consider myself a cerebral goalkeeper, I like to take my time to define the points, positioning, everything. It’s such a nuanced position, I think that’s one of my strong points; just thinking through the game and analyzing and learning. “Throughout the last couple of years at UVA, we really worked to develop my feet and add that comfort level. So I know this could be a sharp learning curve to jump that to another level. I'm really excited for the opportunity to go to a place where I know that'll be encouraged and developed and I can't wait. I hope to thrive there." NYCFC Head Coach Patrick Vieira said, "When you look at the quality of the player, he’s technically really good. I think with the way we play, he’s really comfortable having the ball at his feet. He’s really strong physically and of course, he’s got some skills that he needs to develop but we are really pleased with our pick. "We wanted to be sure that we could bring in the right person to fit in the dressing room. He’s a really good and humble person and is going to work really hard for the football club." NYCFC Sporting Director Claudio Reyna said of Caldwell, "He has really good feet, he's experienced and has had really good years at the University of Virginia. He's a mature goalkeeper who will fit in the professional environment right away with Patrick and we expect him to compete with our goalkeepers. “We’re really excited about it. We thought goalkeepers are becoming a premium in MLS with the expansion and in college, you have a lot of goalkeepers who come through the system and are well prepared. He was our target and he landed with us so we’re excited."